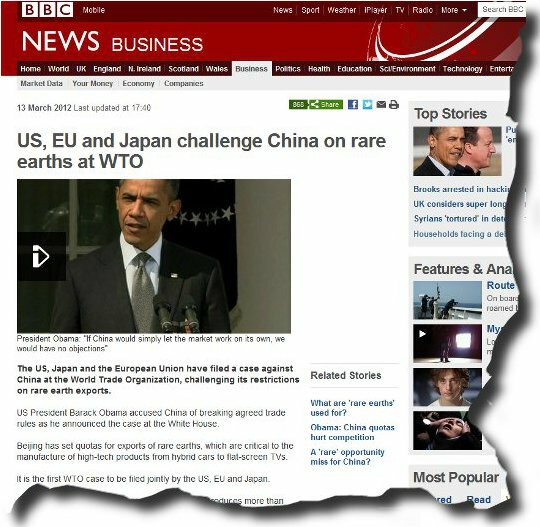 Barack Obama takes a pop through the WTO [World Trade Organisation] at China. While the Federal Reserve has been busy bailing out their Banking Buddies with printing more and more dollars, aka Quantitative Easing, that has led to our rising Commodities prices [most things are priced in US$], aka rising oil prices, food prices etc that is probably the source of hardship to the people of the world who lived on less than $10 per day, China, that’s the USA’s main creditor nation, got in their ships and planes and has been busy spending their dollars traveling the world buying up metal mines and steel works. Or in other words, while the West has been busy congratulating itself that it is a “Service economy” dealing with paper based financial products that are imploding and has sought to produce more of the same [hence why we have not progressed out of the financial melt down of the Credit Crisis] China has been buying up the places that actually produce tangible resources. Some of these they have closed down/ mothballed, aka Steel Mills in North England, all on the basis of a falling demand for steel during the economic downturn. This means that the west is now in the position where the USA/ UK closed down/ sold off what mines it had that produced Rare Earth metals that are so prevalent in today’s technological products. These are found in exciting things such as the electric motors that power electric aircraft, motors that will be used in your electric car, down to the little thing in your mobile phone that allows it to vibrate instead of ring. Mr Obama feels he is being ‘biffed on the nose’ by China’s trading pattern, but failing to realise the previous actions in the west have lead to this situation. When you debase your manufacturing capacity and outsource it overseas, why should you be surprised when you wake up to the fact you’ve also outsourced control of resource? Up the Pyramid A look at where we are, Currency Wars, Trade Wars, Real Wars.